Description: The NS Harrisburg connection flys sotuh past the old depot. Description: A very clean NS C40-9W leads NS 11K uphill past the Brickyard. A bunch of leaves were sucked into the vents of the engine. 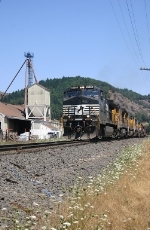 Description: NS 11K continues uphill on track 3 past the Brickyard. The new Dash 9 had sucked a bunch of leaves into its vents. Description: This Eastbound NS train passes through the Westend of Alex City as it heads toward Columbus, GA. Description: A westbound freight behind NS 9558 passes a pair of SD40-2s waiting for a clear signal to proceed east. Description: The CORP's Roseburg Hauler is seen passing a feed mill at a whopping 10 MPH. Description: Crossing the Umpqua River. Description: OOOOOOOOOOOoooooooooooooooooo look at the action red!!!!! Description: Kinda artsy fartsy, I think. But I don't like thinking, it hurts. Hahaha. 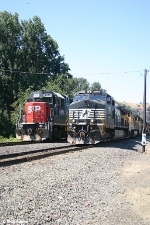 Description: An interesting mix of noses at the south end of Roseburg Yard. The train derailed shortly after I took this shot, so my chase was cancelled. Description: Two NS Dash 9's lead a fast moving intermodal train through the River Yard in Bethlehem Pa. Description: Metuchen Road, 1528 hours. Description: NS 64J (Mingo Jct, OH to Kearny, NJ) is bringing back empty municipal waste containers for refills. Description: Eastbound NS train 33A has a blue Conrail unit sandwiched between two catfish as it heads for Hershey.